One of the long-awaited feature in MLO4 is the Outline Filtering. The following post will demonstrate how you can use the outline filtering when creating your custom views in MLO4. As you know MLO already comes with the list of predefined views which could be used to see your tasks from a different perspective. In MLO4 we have added even more predefined views. So you can start using MLO4 with the views we have already prepared for you. There are views like "Active Starred" or "Due next 7 days" which will show your tasks in different ways. However people always wanted to create their own views. So let's see what has been added in MLO4 here. One of the most useful features in MLO-Windows is the custom views you can create with virtually any filter conditions. This flexibility is essential for many MLO users since they can customize the application to their to-do management style. So let's see how we improved this power in MLO4. I would like to create a view which will show me all flagged tasks. 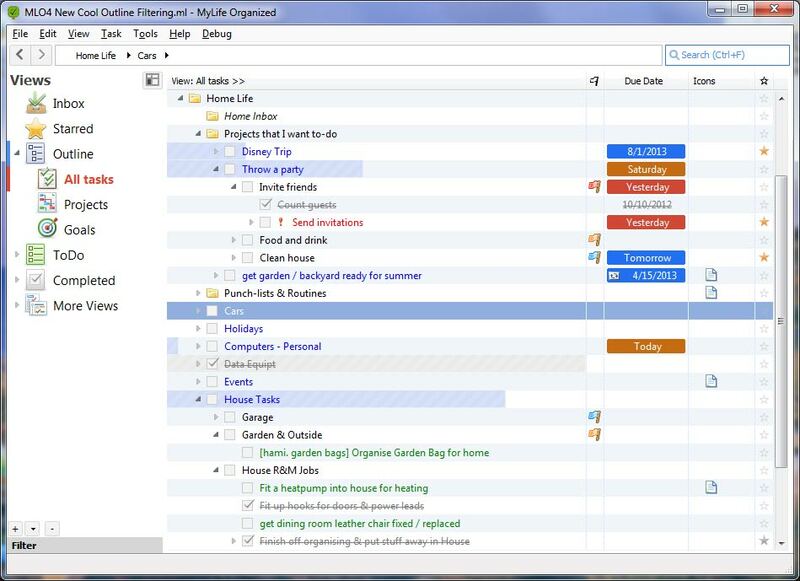 In the picture below you can see the full outline with projects, tasks and subtasks. Let's filter only flagged tasks from this outline. 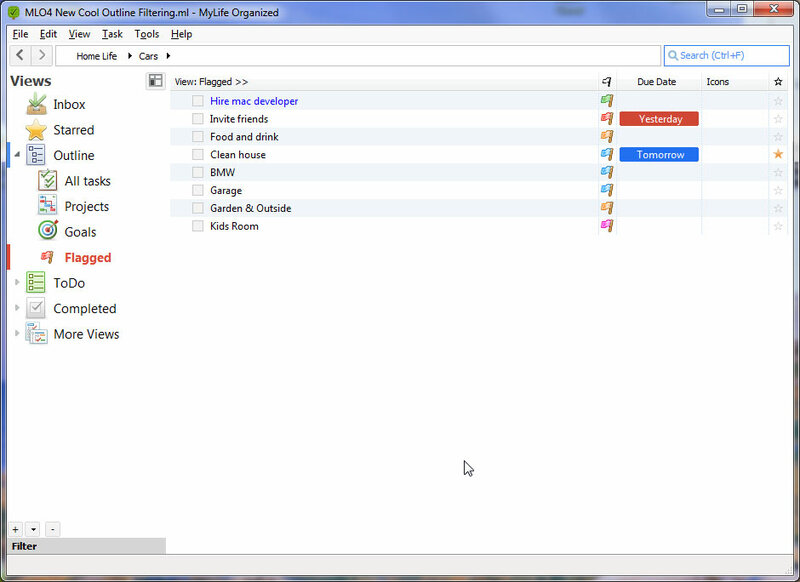 I have created a view with the name "Flagged" and added a filter to show only flagged tasks. The picture below shows how this view looked in the MLO3 filtering system. You will see only the plain list of the filtered tasks. 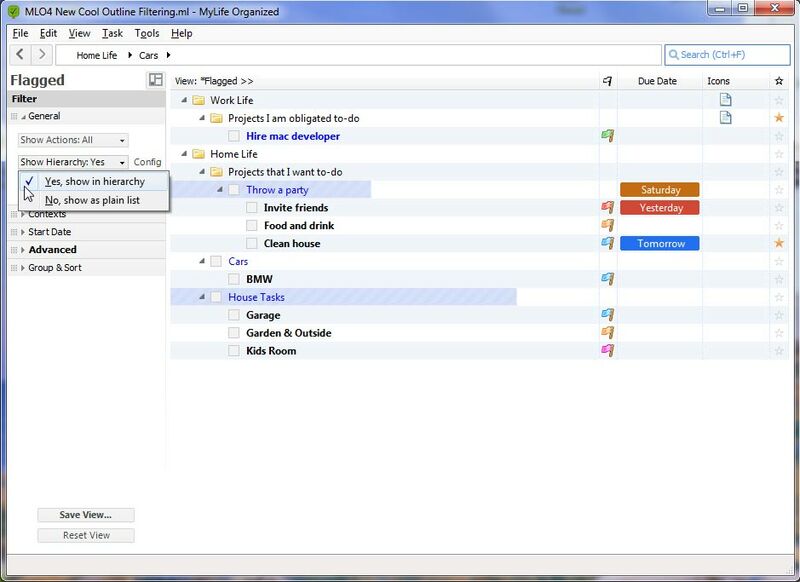 These tasks can be grouped or sorted. Nothing new so far. So let's see what we can do next. Note: only those parts of the hierarchy containing tasks that match the main filter are now shown. In MLO4 we've added even more power to the filtering - the hierarchy (or Outline Filtering). If you open the filter setup panel for your new "Flagged" view you can find the option "Show Hierarchy" in General section. Switch this option to "Yes, show in hierarchy" and ... wooohoo! Now you can see your filtered flagged tasks at their correct places in the hierarchy! 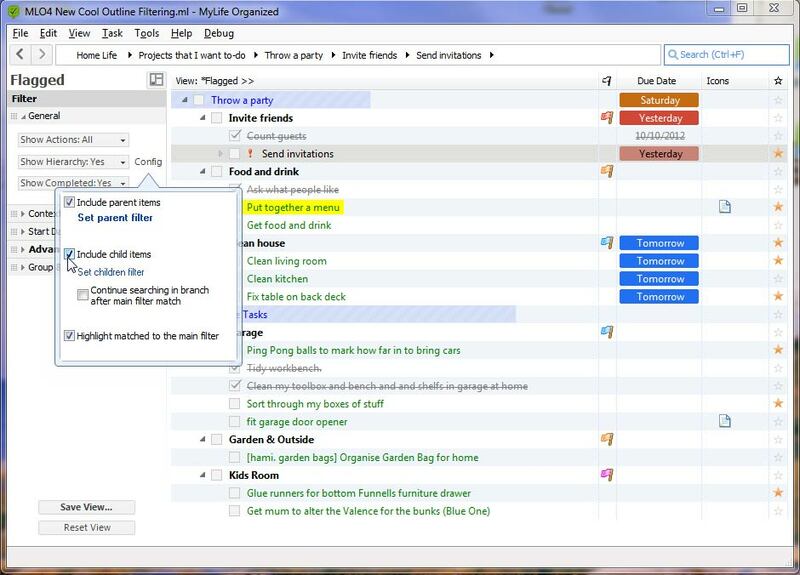 In the picture below the filtered flagged tasks are automatically highlighted with bold to distinguish them from their parents. So now we have filtered our initial outline to see only flagged tasks. 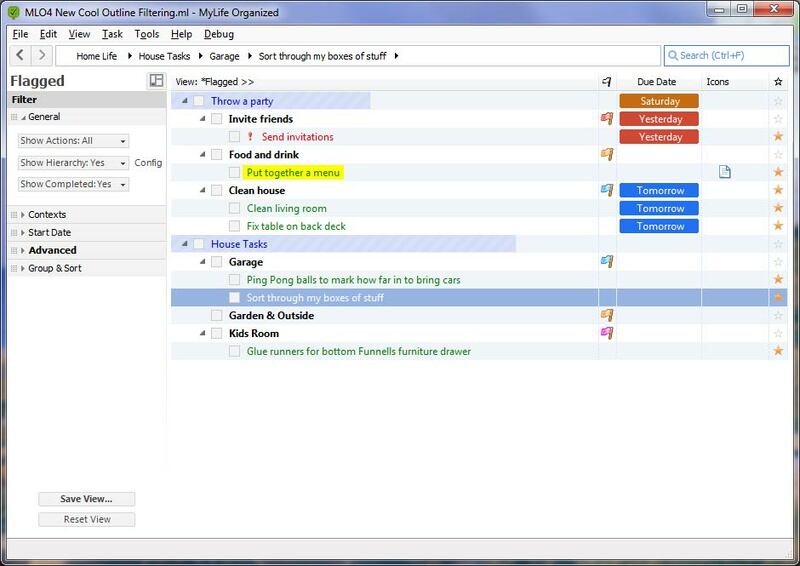 Now in MLO4 you can see your filtered tasks together with their parents by clicking one simple option! For those who only wanted this functionality may stop reading here, since it is powerful enough to suit the needs of most MLO users. For those who want even more power for filtering I will explain additional features of Outline Filtering we've added to MLO4. So what if you want to see not all of your flagged tasks but only those which are from running projects? To configure such functionality click "Config" button next to "Show Hierarchy" option. In the setup dialog you will be able to configure how hierarchy should be shown for your view. Under "Include parent items" checkbox click "Set parent filter". This additional filter will apply only to the parents of the items that have matched the main filter and you can set additional condition here. In the advanced filer setup add filter for the projects with "In Progress" status. So together with main filter which searched only flagged tasks we've also configured additional filter for their parent tasks which should be projects with "In Progress" status. 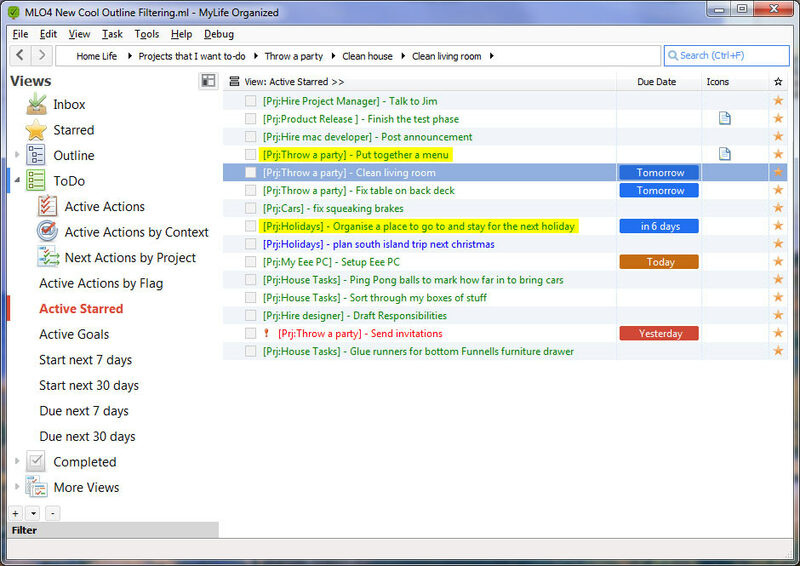 Now you can see that only flagged tasks from such projects are visible in the list. In the hierarchy configuration dialog you can also check "Include child items". This will display all the child tasks of all filtered flagged tasks in your view. 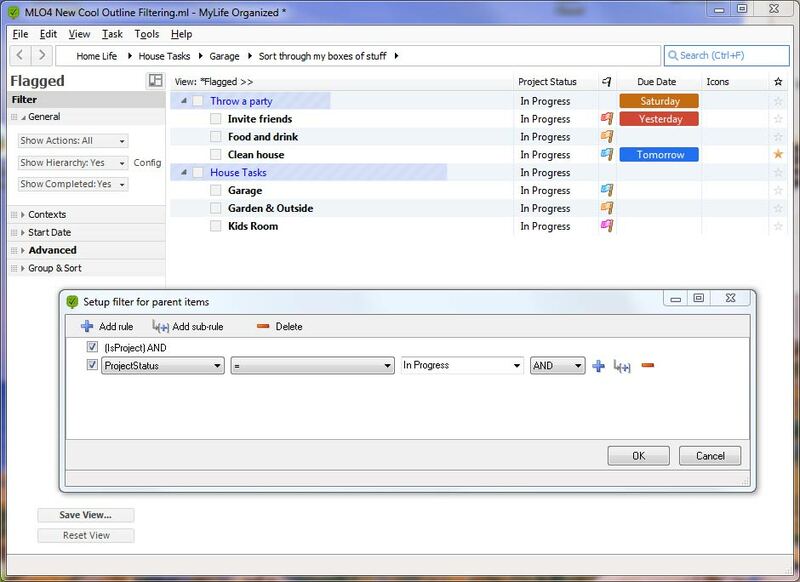 For example the flagged task "Invite friends" from running project "Throw a party" now show their subtasks "Count guests" and "Send invitations" included to the view. We can go further: lets say that I want to only see the starred child tasks of the flagged items selected by the main filter. To do this I will just set additional filter for the child tasks. So as a result in addition to the a) main filter to search flagged tasks we have b) parent filter to search "In Progress" parent projects and c) child filter to search starred subtasks. In the picture below you can see that our "Invite friends" flagged task now only shows the subtask that was starred: "Send invitations". As you can see in the picture above we've filtered our initial outline to see only flagged tasks from the running projects together with their starred subtasks. 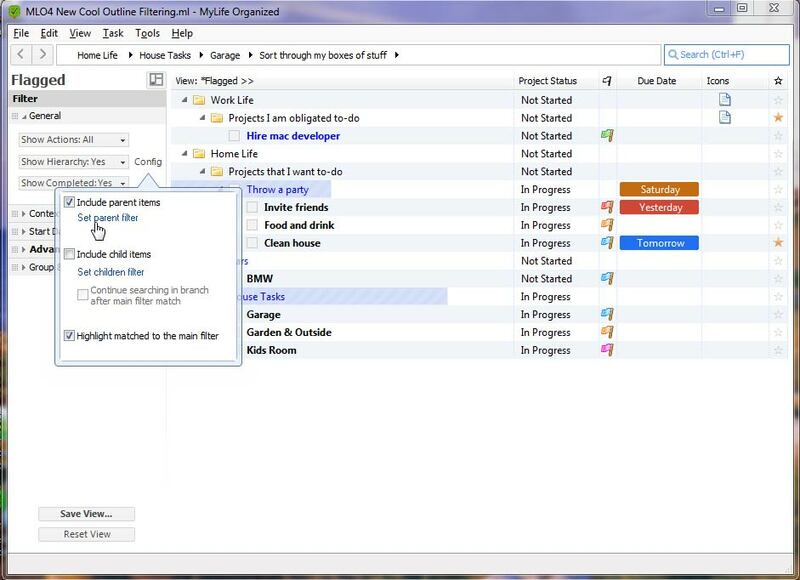 I hope this new feature of MLO4 will help you to increase your productivity even more!